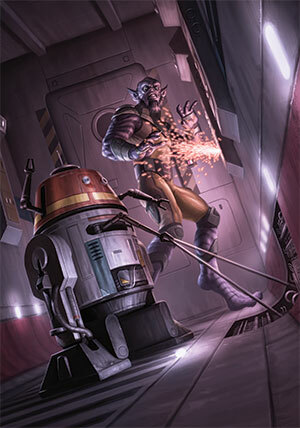 From hyperdrive and ion cannons to protocol droids and medical devices, Technicians keep the Star Wars™ galaxy running. These creative, resourceful individuals are willing to work hard and get their hands dirty in physically and mentally demanding tasks. It is high time that Technicians get some new tools for their trade. 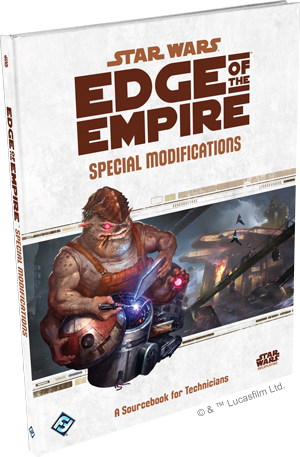 Therefore, we are proud to announce the upcoming release of Special Modifications, a Technicians’ sourcebook for the Star Wars®: Edge of the Empire™ roleplaying game. 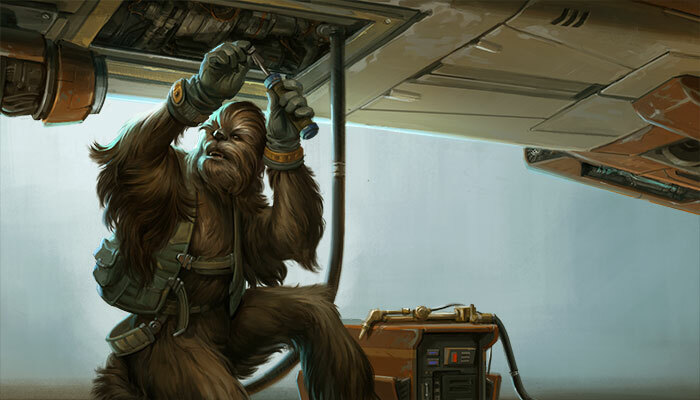 Special Modifications brings new specializations and signature abilities to the Technician career. 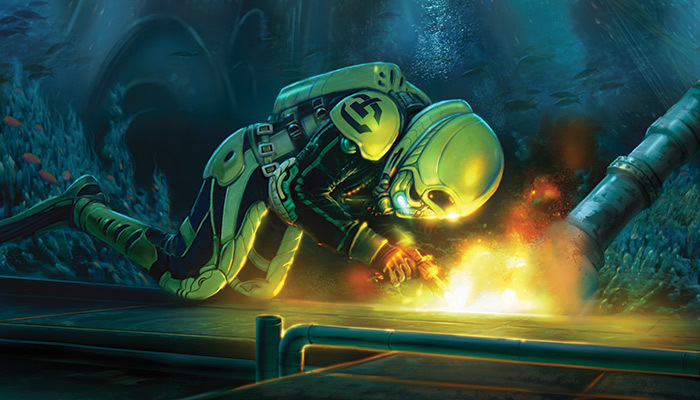 Its 96 full-color pages also include new playable species and copious amounts of gear, including cybernetics, slicing tools, construction tools, and remotes. Finally, the book contains detailed guidelines for crafting devices, weapons, and droids of your own invention, as well as new slicing actions and expanded rules for running slicing encounters in your roleplaying adventures. Most Technicians are naturally gifted. They don’t need an instruction manual or advanced education to figure out how to make things work. They can simply look at a mechanical problem and intuit how to solve it, or look at a set of components and instinctively perceive how to fit them together. The Technician specializations of Core Rulebook—Mechanic, Outlaw Tech, and Slicer—encourage this kind of innate, broad technical aptitude. Those of Special Modifications are more highly specialized. A Cyber Tech unites mechanics and medicine in order to enhance biological bodies though cybernetics, whether that means crafting the cybernetic body part or surgically implanting and connecting it. Droid Techs focus on creating and maintaining sentient machines, from service patch remotes with simple programming to canny, headstrong astromechs. Modders are more versatile, but most interested in relentlessly repairing, adjusting, customizing, and optimizing the technology around them. The two signature abilities of Special Modifications give Technicians the means to produce imaginative innovations and use their skills well in the most dire of emergencies. Inventive Creation allows a Technician to build a device of their own invention out of any materials at hand. At the end of the encounter, however, the device will come apart, short out, or otherwise permanently cease to function. For example, if you need a ranged weapon and are lost in the forests of Nal Hutta, you might use Inventive Creation to fashion a bow out of vines and sticks. Unmatched Calibration increases your chance at success in a single pivotal moment once per session. At its base, Unmatched Calibration allows you to reroll up to two dice in your pool—enough to make a critical repair to your ship or slice into protected enemy systems. Both signature abilities can be upgraded to enable more impressive feats—such as building entire vehicles or changing the dice you roll in your pool. Technicians tend to be fond of their tools and their toys, so Special Modifications is chock-full of gear, vehicles, and attachments for them to play with and share with the rest of the team. Outlaw Techs and Slicers, along with Smugglers or Bounty Hunters, may want cloaking coats, which hinder scanners and electronic devices from perceiving their presence. Slicers may also want to invest in a few dataspikes, which make disabling security programs much easier. Cyber Techs might be interested in implanting a neural recorder, either in themselves or an ally, which gives the owner as close as a sentient being can get to a perfect memory. An intelligent toolbox which can respond to verbal commands could simplify life for Mechanics or Gadgeteers who often have their hands full. New weapons attachments include a sonic scope that can detect targets through the hardest, densest surfaces, and an integrated scanner that allows you to maintain an awareness of your surroundings even while staying on target. You might upgrade your smuggling team’s ship with decoy buoys to fool Imperial law enforcement and a laser focusing array to make your cannons and turboblasters more likely to deal critical damage. No matter what your group drives or flies, your Technician now has plenty more options for customizing that vehicle. 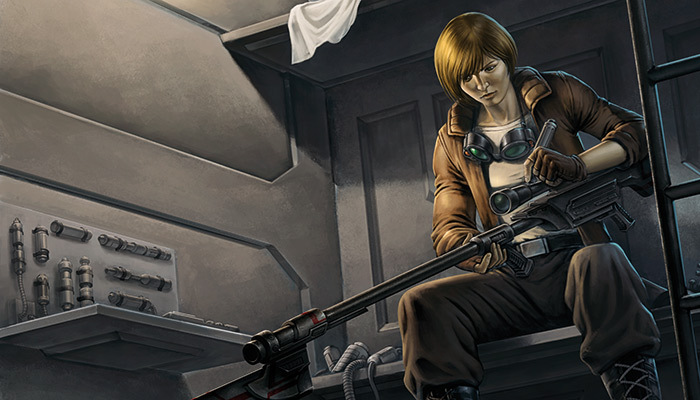 The Edge of the Empire Core Rulebook handles a huge variety of crafting, tinkering, repairing, and manufacturing tasks by simply calling for a Mechanics check and letting the results of that single check shape the narrative. Special Modifications at last offers more detailed guidelines for making weapons, droids, cybernetics, and other devices, including ways to spend dice results that affect both process and the final product. Weapon and device crafting involves choosing a template, procuring materials, and finally, construction. To build a droid, you’ll first select a chassis which determines the droids’ basic characteristics. Then, you’ll program in directives that shape its talents and skills, and finally you’ll determine the sentient machine’s quirky personality traits. Since Technicians often earn a living from their trade, you'll also learn about determining how much a hand-crafted item might sell for and how much a Mechanic should get paid. Similarly, slicing means much more than testing your skill in Computers. Slicers and other tech-savy characters now have specific actions to choose from, such as Acess System, Enact Command, and Trace User. Their dice rolls in such actions may result in permanent secret backdoors into Imperial systems, or in evidence of their tampering being left behind. GMs will find suggestions for staging slicing encounters, including how to manage the hostile systems being sliced into. Special Modifications won’t only delight career Technicians playing Edge of the Empire. Spies, Aces, and Engineers fighting for justice in Age of Rebellion™ may want to pick up the Modder specialization. Artisans of Force and Destiny™ may fancy some innovative new tools and Consular Healers might want to acquire the talents of a Cyber Tech. No matter what your technical background or area of expertise, Special Modifications enables you to upgrade your skills, weapons, ship, and game. Special Modifications will be available in the first quarter of 2016.